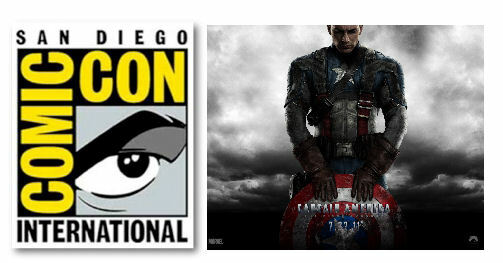 Each year San Diego Comic Con houses a number of exclusives that attendees have a chance to pick up. Usually the chances are slim and the demand is high so attendees have to plan accordingly and this year will be no different. Comic Con is this week and today a number of exclusive previews of some fantastic artwork went online. 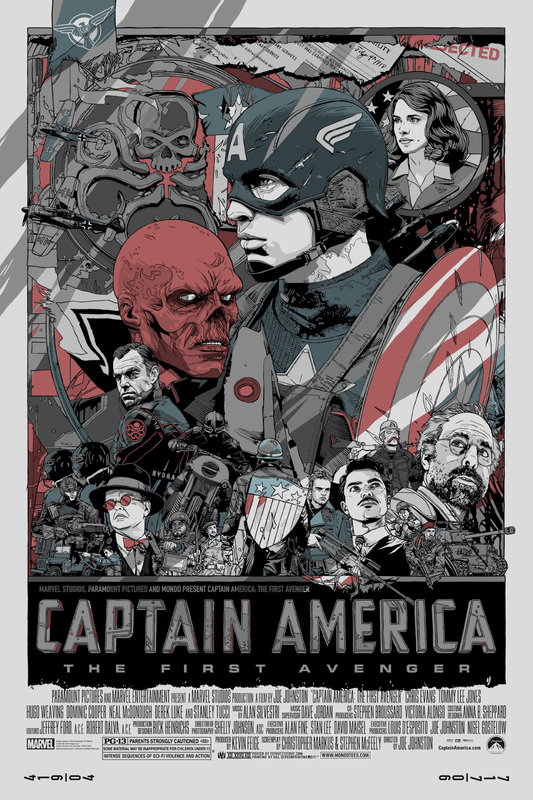 The great folks over at Mondo have commission 3 different artists to produce some "Captain America: First Avenger" artwork to coincide with the theatrical release this weekend plus his presence at SDCC and you can see them here before you line up to try and buy them at Comic Con. Take a look below at the gorgeous work and some details on exactly how you will be able to get your hands on them. 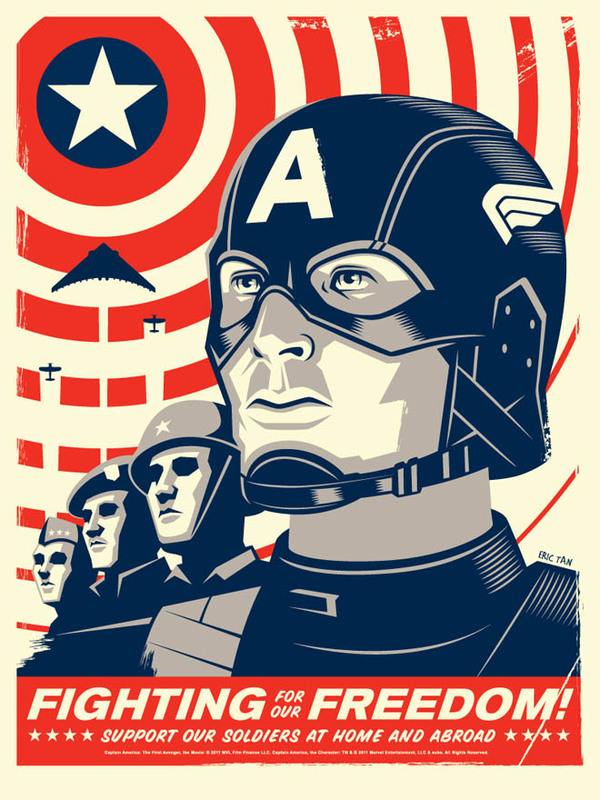 First up is Tyler Stout's "Captain America: First Avenger" print and its variant. Each poster is 24" x 36". The poster pictured below on the left will run $50 and is part of a 650 set run. The (variant) with silver pictured below on the right will be $100 and comes in a far more limited run of 220. 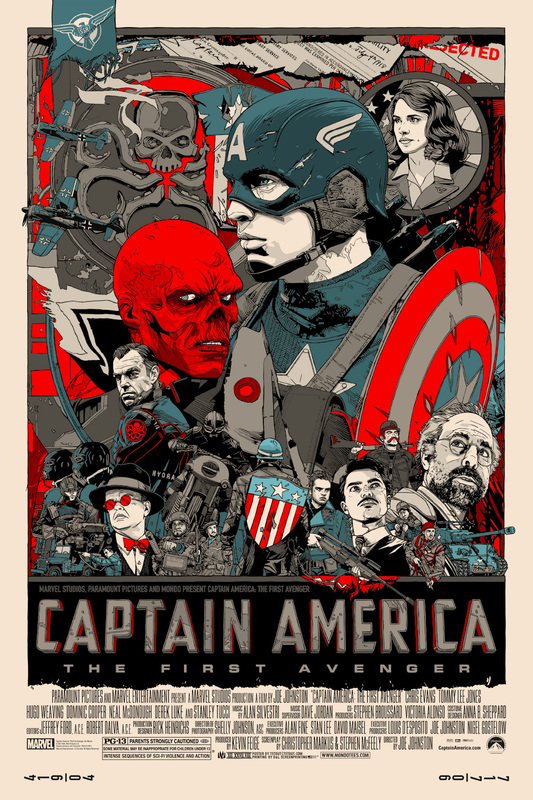 These prints are stunning and as a Captain America fanatic I've certainly thought about risking life and limb to get one of these amazing pieces of Stout's history. That said, there is still more to show you. 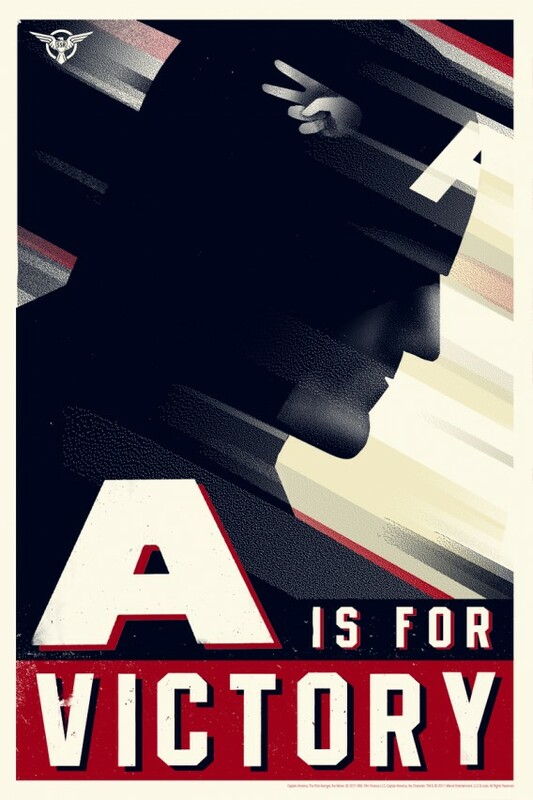 Next up is two sets of WWII propaganda posters that were designed by Eric Tan and Olly Moss. Like all good propaganda artwork, these posters are selling a message and pushing a belief to either side. 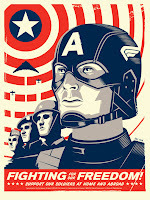 As a U.S. and World History teacher I have an assignment each year where my students create their own propaganda posters. It is an assignment the students enjoying doing and looking at these phenomenal pieces of art you can see why. There is so much to pine from. These posters are being sold as sets. So you can buy the Eric Tan or Olly Moss set with two 18" x 24" prints. One focusing on Hydra and one focusing on Captain America. Enough chatter, checkout the posters. Eric Tan's set which will cost $80 and is a limited edition of 220. Olly Moss's set which will cost $85 and is a limited edition of 375. All of these prints will be available at the Mondo booth #433. Mondo has already stated that any "new" prints will only be available twice daily. One in the AM and one in the PM. They have stated that times will not be announced ahead of time and you will have to follow them on Twitter @MondoNews in order to receive updates on when these hot items will be available. 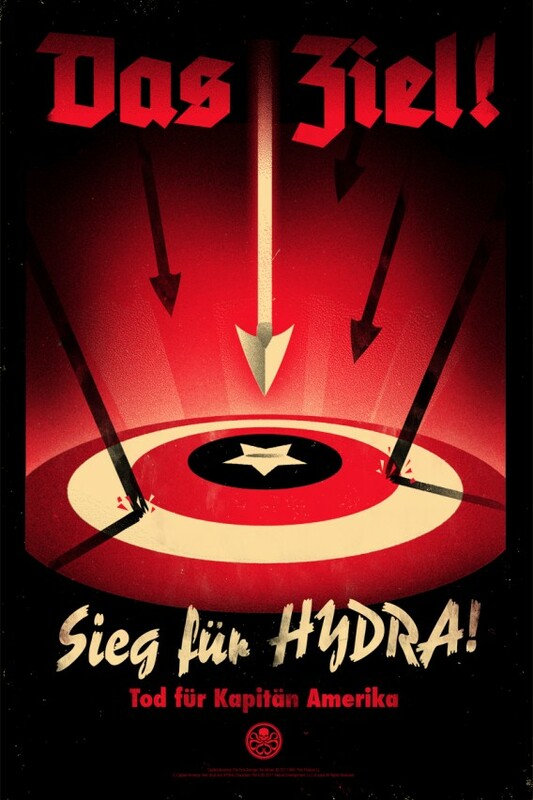 That's not all, Mondo will have free stuff at their booth as well as some archival posters from their history. 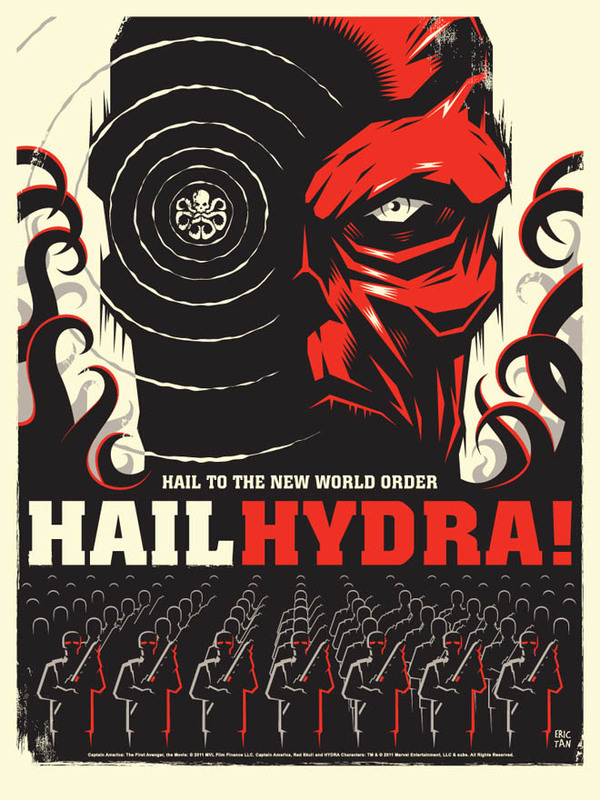 So if there is a particular poster you've been hoping to find, you never know what Mondo will have. Good luck to all of you and I hope you have a blast at Comic Con!